Are you searching for the best Winchester gun safe reviews? I know how important it is for you to get a quality gun safe, and that’s what I have prepared here. There are a lot of good gun safes available, but I have gone through them and chosen the top five. Finding the right gun safe takes a lot of time. Even if you narrow the list down to Winchester products, there are still a lot of gun safes to choose from. That is what this review guide is for, to help you make that choice. The name Winchester has been associated with security protection since 1886. A lot has happened since then but one thing hasn’t changed: the company’s commitment to quality. This can be seen clearly with their gun safes. They manufacture a wide range of gun safes, but the following are what I consider the best of the bunch. We all know how important it is to keep our weapons secure yet accessible at the same time. These gun safes are not just built for guns but your other valuables too. 5 Where are Winchester gun safes made? Here’s a quick comparison of the five gun safes. Both the 45-7-E and the 31-7-M have four-way locking systems and three spoke vault handles. The 19-7-M has similar contraptions and multiple fireboards. Both the 26-7-E and the 26-11-E have five spoke vault handles. This comparison is meant to give you a brief overview of their features. For more details read the reviews below. The 45-7-E Ranger is being called the best Winchester gun safe and with good reason. It’s solid, reliable and comes with a lot of features to satisfy the most demanding users. Its 51 gun capacity is the highlight, but there’s more. The 45-7-E Ranger weighs 985 lbs. more or less, one of the heaviest gun safes you can buy. You’re going to need some help moving this, but at least burglars won’t have an easy time either. The overall dimensions are just as impressive at 72″ (H) x 40″ (W) x 30″ (D) for the exterior and 69″ (H) x 36″ (W) x 18″ (D) for the interior. The 45-7-E can withstand fire for up to hour at 1400 F. What makes this possible is the presence of multiple fireboards along the door and other vital areas of the safe. Nobody wants to think about a fire, but in case it happens your firearms and valuables are protected. The 45-7-E also has an easy to use an electronic lock, a 4-way locking bolt system, and 18 steel locking bolts. The electronic lock is a really nice feature: you just input your code and it’s locked. Enter the code again and you open it. There’s also a low battery indicator on the keypad. The 45-7-E Ranger has an interior capacity of 45 cubic feet and that translates to a lot of space. Open the gun safe and you’ll see a ton of pockets on the door for ammo and other accessories. At the top of the door are 8 small pockets. Below it is zippered pockets for guns, ammo, magazines, scopes and other equipment. The top shelves are long enough to store long firearms or several pistols. Below the shelves are adjustable shelves for cleaning tools, hearing protection, holsters, and targets and so on. The bottom line is the 45-7-E comes with a lot of shelves and pockets for your guns. The 51 gun capacity, I must add, is dependent on the types of gun you have. Anyway you look at it, however, the 45-7-E is a huge and dependable gun safe. Very heavy, at least 300 lbs. The 31-7-M is ideal for those looking for a dependable gun safe. 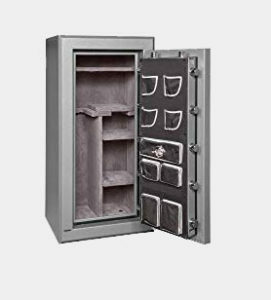 Winchester has manufactured a lot of gun safes, and the 31-7-M is one of their top efforts yet. From security to reliability, the Deluxe gets it done. The 31-7-M has interior dimensions of 56″ (H) x 32″ (W) x 16″ (D), with the exterior dimensions at 60″ (H) x 36″ (W) x 28″ (D). This is an indication of how spacious the 31-7-M is, and at 745 lbs. is heavy enough to deter criminals. All Winchester safes have ample security features, and the 31-7-M is no exception. There are multiple fireboards in the critical areas of the safe like the ceiling, door, and body. The gun safe has solid welded metal hinges for a full swing, and its multiple fireboard layers provide additional protection. The gun safe comes with a durable mechanical lock for enhanced security. Apart from its solid construction, the 31-7 M has a 4-way blocking system with three spoke handle. The gun safe also has a Palusol heat expandable door seal and a Chamberlain disk for lock protection. Additional features on the 31-7 M are its metal locking bolts, auxiliary relocker, UL listed lock standard design. 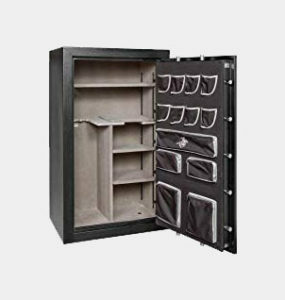 Compared to other gun safes, the 31-7 M is complete as far as feature sets go. Even if there’s a fire, it can withstand the heat at 1400 F for an hour. The 31-7 M has a lot of strong points, and one of those is its organization. The door comes with a lot of pockets both large and small. The interior has a capacity of 31.3 cubic feet, more than enough for most gun owners. The interior top shelf has room for an assortment of pistols, handguns as well as gun accessories. The shelf cutout on the left allows you to store any number of rifles there, and the three shelves offer more than enough space for ammo, magazines, holsters, shooting glasses etc. How you arrange the items inside the gun safe is up to you. But the one certainty is there’s going to be lots of space for it. As far as capacity and durability are concerned, the Ranger Deluxe 19-7-M is comparable to the Winchester biometric gun safe. It shares some features with the other gun safes, but it also has unique traits. A good gun safe should have ample interior space. It should also be heavy enough, so robbers won’t be able to drag it out of your house. The 19-7 M meets both requirements: it weighs 520 lbs. which makes it very difficult for anyone to haul it out without alerting you. The gun safe measures 60″H x 28″W x 23″D and the interior is 56″H x 25″W x 14″D. We’ll look at its gun capacity and organization later, but for now it’s clear this is comparable to the top gun safes. The gun safe has a standard electronic lock or a Group II UL listed S&G mechanical lock. Like the other Ranger gun safes, the 19-7 M has a 1 hour/1400 degree fire rating. There are three fireboard layers on the 19-7 M door and a couple of fireboard layers on the body, underscoring its durability. It also comes with Palusol heat expandable door seal. As the name makes clear the 19-7 M has 24 gun capacity. The product advertisement says the 19-7 M can hold up to 24 long firearms: this is true, but only if you remove all the shelves in the gun safe. Removing the shelves gives you enough room for two dozen long firearms. If you need room for your handguns and other accessories, you can put them in the various pockets at the door. Removing the shelves and putting them back in easy enough so it won’t be an issue. If you do keep the shelves you can use that for handguns, ammo, headgear, holster and other items. While the gun safe is designed mainly for guns, you can use the shelves for documents and other items. The 26-7-E is one of the most popular models in the Legacy class. It has all the features you would expect from a high-quality gun safe, and it combines security and capacity as well. The 26-7-E is weighed 925 lbs. and being almost a ton is enough to discourage most would-be burglars. The entire unit measures 60″ (H) x 30″ (W) x 28″ (D), with interior dimensions of 54″ (H) x 26″ (W) x 19″ (D). With these figures, it’s not hard to see how it can fit a lot of weapons and accessories. It is very heavy, so once you have decided on a spot for the 26-7-E, that’s where it will stay. Once you have this in position, however, no one will be able to move without anyone noticing. The Legacy is brimming with security features. Its fire rating is 2.5 hours at 14 degrees F, one of the best you’ll come across in gun safes. The lock is UL listed, the default mechanical lock is top notch, and it is possible to upgrade this to an electronic one. There is also a titanium disk, providing the unit with a drill resistant area. There are external hinges for maximum fire protection, and the hard plate adds extra protection in case someone attempts to drill the lock. Lastly, there is an auxiliary relocker, so if someone tampers with the lock the relocker is activated. And like the other gun safes in the Legacy line, it has multiple fireboard protectors, a power docking system, and 4-way locking bolt system. The 26-7-E comes with a wide range of pockets and shelves. There are numerous pockets lining the door, and the top ones are small and ideal for storing gun accessories and other items. Depending on how you arrange the interior you can put any number of guns in the pockets as well. The interior is nicely arranged: at the left side, you can pack a number of rifles, while on the right are several shelves for ammo, bags, speed loaders, carry and conceal bags and so on. Bottom line: you won’t be lacking in space. The 26-11-E epitomizes the best that Winchester has to offer. This is a rock solid, heavy gun safe and a must for the serious gun collector. It also comes with a diverse range of features that keeps your firearms protected. The gun safe weighs 925 lbs. You won’t be able to haul this in yourself, and it’s spacious too. The interior dimensions are 54″ (H) x 26″ (W) x 19″ (D), which translates to a capacity of 26 cubic feet. Overall the gun safe measures 60″ (H) x 30″ (W) x 28″ (D). The Legacy gun safe is built to withstand 2.5 hours of fire at 1400 F, very impressive. This is possible thanks to its fireboard layers on the body and the door. There are also four fireboard layers around the body and one on the door, and they make all the difference. The other security features are just as good. The electronic lock keep the content safe from burglars and children, but it’s easy enough for anyone with access to use: just enter your code and the safe opens. The Legacy has a 4-way locking system, 14.2-inch steel shafts and a 5 spoke handle. With these features, you can rest easy knowing that your guns and whatever valuables you put in there are safe. The 26-11-E gun safe also has a chamberlain disc that acts as a shield against attempted drilling. The auxiliary relocker adds protection against physical assaults on the safe. Even if a burglar tries to open the safe by force, the door is pry resistant. Throw in the hard plate, the steel body, fortified door jamb and its other components, and you have a solid gun safe. The 26-11-E has a very similar organization setup as the 26-7-E. There are several pockets on the doors and a roomy interior. The shelves can be adjusted or removed entirely if you want to put long rifles in it. Otherwise just use the shelves and pockets to organize your stuff. Gun safes are a necessity for every gun holder. Gun safes ensure that their firearms are protected from theft or misuse. Most states around the world have access prevention laws hence gun owners are looking for a good secure gun safe that will protect not only their rifles but their loved ones too. Enter the Winchester gun safe; any enthusiastic gun collector knows about Winchester rifles. Established in the wild 80s, Winchester has come out as a household name in the ammunition world. It is one of the few brands that offer both rifles and the safes with which to secure them in. They also offer other gun accessories too. These gun safes can also be used to protect your important documents and other valuable items too. Well, over 30 years old, Winchester safes are an American original whose goal is to satisfy the needs of all gun owners by ensuring their safety and accessibility. The safes, just like the guns are named after their founder, Oliver Winchester, a shrewd American businessman and politician. Since their inception, Winchester has been consistent in providing their clients with the very best safes with which to secure their ammunition in. Where are Winchester gun safes made? 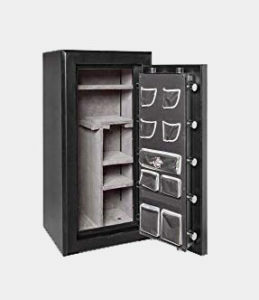 Initially, the gun safes were outsourced from China as a cost-cutting measure but most clients preferred safes that were made in America so as of 2012 most of them are made in their manufacturing plant which is based in Fort Worth, Texas. To find out the country in which their safe was made, they need only check for the inscription on the safe or call them up to be completely sure. The only company who makes Winchester safes is the Winchester company itself. The gun manufacturer knows exactly what you need to keep your guns safe. Reading reviews of Winchester safes should tell you enough about their quality. There are several advantages to owning one of your own. Whether it is a Winchester 10 gun safe or a Winchester 20 gun safe, you can be sure that your guns will be safe inside one. There are a lot of dangers to your guns out there and this safe can protect against all of them. First, there’s the danger of theft. Winchester safes are all made of solid steel and feature a wealth of security features to ensure no burglar reaches your guns. Second, there is the threat of fire. When your home catches fire, there’s no need to rush back in to get your guns. You only have to trust in your Winchester safe to keep your guns from the extreme heat they will face. When you come back, they’ll be as if the fired didn’t happen. The Winchester brand is as American as apple pie. This is why the company makes each one of these gun safes in Fort Worth, Texas. If you like keeping your dollars in the US, Winchester is the brand to buy. The company invested millions to buy the equipment out there and bring their facilities up to standards. The result is competitive prices while still manufacturing in the United States. A Winchester security safe is a good investment when it comes to gun storage. However, you will need to maintain it properly. Proper maintenance ensures that you will get years of use out of your gun safe. This requires regular cleaning and oiling. Cleaning should be easy enough. All you need is a soft cloth and a neutral cleaning solution like soap and water. Soft cloth is necessary since you do not want to leave scratches on the surface of your safe. A neutral cleaning solution is for the same reason since harsher cleaning solutions tend to strip away any coating that the makers place on their safes. Oiling should be done monthly to ensure that your hinges are in good working order. Application is simply to the top, sides, and bottom of the hinge and the excess wiped away afterward. Maintaining your gun safe is just one aspect of its operation. You may also want to add more functionality to it. For example, a Winchester gun safe door organizer is available that adds more storage options to your gun safe. Added to your safe door, it can be a good place to store gun parts and ammo. Additional accessories are available that make your gun safe more comfortable to use. This includes lights and barrel rests for your rifles. If you really want to get the most out of your gun safe, buying these add-ons is a good idea. Seriosuly consider them so that your safe can store your firearms the best way. So, how does the Winchester match up to the equally popular stack-on safe? Well, they say old is gold and being much older than some of the brands in the market, they have a wealth of experience in making products that are in line with emerging trends. The warranty on stack on safes is not transferable hence on this point it loses out to the Winchester gun safe. However, stack-on safes come with a promise of water-resistance which most gun safe manufacturers leave out. 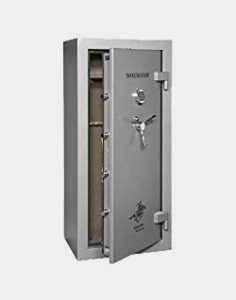 Another selling point with the stack on safes is their pricing being that they are relatively cheaper compared to the Winchester safes making them more attractive to buyers. On the fireproof rating, Winchester safes fare better than the stack-on safes. 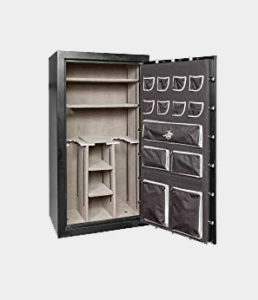 Cannon gun safes are another popular gun safe brand in the market manufacturing some of the best gun safes in terms of durability. They thus are a formidable force to reckon with. What sells the Winchester models over the cannon is that these safes have a heavier build which makes them easier to manipulate. They are also a lot roomier compared to the cannon safes and have a better fireproof rating. Some cannons are a bit cheaper than Winchesters which might attract customers looking for a cheap good buy. All in all, it is important to not jump the gun but play it safe while on the hunt for your perfect gun safe. Take time to find out which brand meets your expectations and the Winchester models should be among your first considerations! Do I Really Need a Winchester Gun Case? It’s not a requirement, but having a trusted brand secure your firearms is a good idea. Though there are other gun safes on the market, there’s nothing like the Winchester brand of assurance. If you’re storing Winchester rifles, a Winchester-brand gun safe would be appropriate. However, if you’re only storing small guns, you can opt for something smaller. With the size of a Winchester gun safe, you will need professional movers to transfer them. Most safes only need a good bit of muscle power to move them. If you’re alone, you may need to hire some help. However, it should not be that expensive. How Good are Winchester Safes against Fire? A Winchester gun safe can stand up to fires of 1400 degrees Fahrenheit. That’s a big jump from the average 1200 degrees. This guarantee of fire protections lasts up to 2 hours. This should be more than enough time to get the fire under control. What sort of locks and security features can I expect on these safes? Depending on the model, you can expect an electronic lock, a bolting system, and more. These should ensure your gun’s safety from theft. It depends on what guns you have. It is best to order a small one if you only have handguns, while larger ones are for rifles. It’s hard to emphasize the importance of a quality gun safe. Not all gun safes are built to last and don’t really keep your firearms secure. With the Winchester, it’s a different story as they’re all built to protect your weapons. 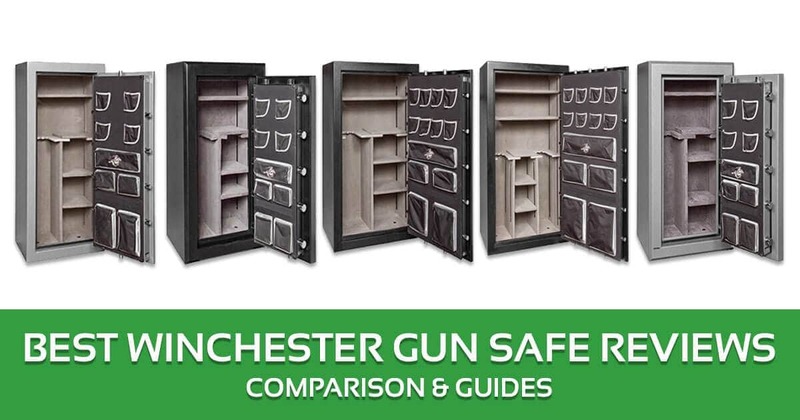 Of course in all Winchester gun safe reviews there needs to be a winner, and in this case, I choose the Winchester 45-7-E. All these gun safes are excellent, but the 45-7-E has a 51 gun capacity, which the others cannot match. Sure you might not need all that space for now, but if you’re a gun collector the 45-7-E is your best bet. Honestly, I haven’t heard of the Winchester Gun Safes before. This was my first time having to do all the details on this site. The top 5 models helped a great deal. Furthermore, I liked the way diverse features of the safes have been highlighted. I am intending to buy the Winchester Legacy Premier Gun Safe. It is able to handle my 25 guns and a fire resistance of 2.5 hours is all I wanted.